“The Balkans are Europe's myth. They have been the screen onto which Europeans projected their dreams – and this has been their doom. “This is how Slovenian philosopher Slavoj Žižek summarised the relationship between Europe and its Southeastern limb in a recent lecture series in Montenegro. “Westerners,” continued Žižek, “showed all their ignorance in the Nineties when wars and massacres were taking place in the former Yugoslavia. They didn't understand that, with the regime falling, the Communist nomenclature sought to legitimise its power and, for this very reason, it had started to befriend nationalism and foster conflict." Despite the past, however, Žižek is convinced that the European perspective is good for the Balkans. 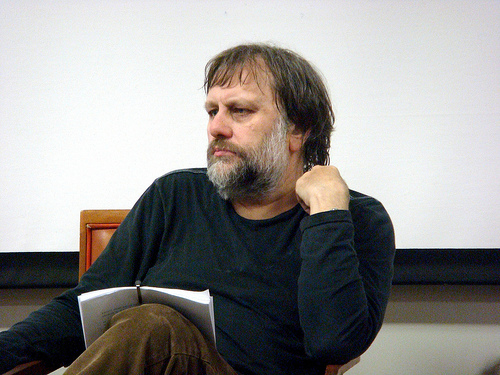 Philosopher and psychoanalyst Slavoj Žižek is among the most influential intellectuals in the Western press. A US daily defined him “the Elvis of cultural theory”. Born in Ljubljana in 1949, he founded the Lacanian school in Slovenia, teaches at Ljubljana University's Faculty of Sociology, and has collaborated with several European and US universities. He also writes for several international journals and magazines and is is renowned for his gift as populariser, his mass-culture observational skills, and his flair for de-constructing stereotypes. His main publications include: The Sublime Object of Ideology, Enjoy Your Symptom!, Everything You Always Wanted to Know About Lacan...But Were Afraid to Ask Hitchcock, The Metastases of Enjoyment, The Ticklish Subject, Did Somebody Say Totalitarianism?, The Puppet and the Dwarf: The Perverse Core of Christianity, Iraq: The Borrowed Kettle, The Universal Exception, Terrorism and Communism, First As Tragedy, Then As Farce, and the forthcoming Living in the End Times. “Many friends of mine, so-called leftist radicals, are against the EU. They see it just as a tool of capital to impose its standards and faster get rid of the welfare state...that may be true, yet, unfortunately, we belong to Europe - whether in or out. Actually, experience shows that, if you are out, the EU exploits you even more. How? By bringing in its polluting industries, violating environmental norms, exploiting your agriculture. This why staying out is not an option. The only option is to join the EU and try to create a sort of leftist coalition within it." How do you think Brussels' attitude towards the Balkans is changing? Is there more openness? Certainly. Yet, the experience of the last decade shows that Europe, unfortunately, has not managed to rise to the challenge and become a more serious project. We do not yet know what it wants. The problem is that two countries, Germany and France, want to rule – this is not good. This is why I'm not completely optimistic. However, I believe that, for some geopolitical reasons, the Balkans are much better off now. How do you see Serbia's future? Serbia must decide for itself, not only in a strictly political sense such as with the acknowledgement of crimes in Bosnia for example, because the problem is much more serious. I think Serbia - and it's not alone – has not yet taken a stand for a modern Europe. There are still divisions and traumas; the struggle is not over yet. This is not only true for Belgrade. Unfortunately, even in other parts of Europe, nationalist populism is getting stronger, especially in xenophobic parties that are hostile to immigration. These political forces are going to become more and more integral parts of governments and this is Europe's darkest future. And what do you think will be the future of Kosovo? This is a difficult question. The situation is utterly irrational. Now I'll tell you something absurd. Maybe it would be better if Kosovo, with some kind of international coordination, joined Albania. In the long term, it would be the only rational solution because it is totally insane to have two states for one people. This is why I have always been sceptical about Pristina's independence. This was part of the US strategy for the region which, however – it turns out – is not able to solve the problem.